As Sea Ray points out above, the 21 Jet is brand new for 2013 and a recent brand new departure for this, arguably one of, if not the largest pleasure boat manufacturer in the world. Sea Ray has not offered a jet boat runabout for decades. But in those intervening decades, jet boat propulsion has come a long way. At twenty-one feet, six inches length overall on a full trailerable width eight foot, six inch beam with a dry weight of 2,883 pounds (1,308 kg), this is not a small boat. 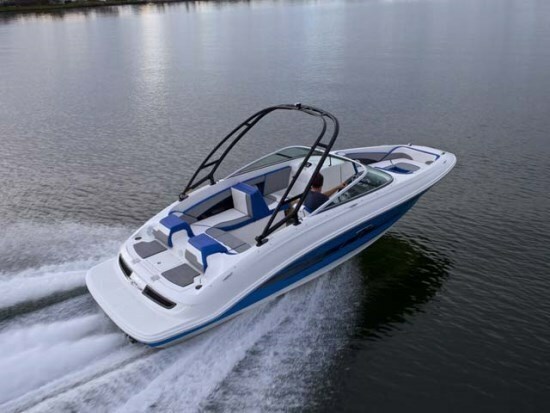 The 21 Jet is powered by twin Weber MPE-850TC four stroke engines, turbocharged & intercooled, w/Weber Jet Drives producing 120 horsepower each, which Sea Ray says, allows the boat to plane “in as little as four seconds.” And of course the relatively steep 21-degree deep-vee deadrise of the hull means the 21 Jet will handle and corner just like every Sea Ray bowrider you’ve been used to. 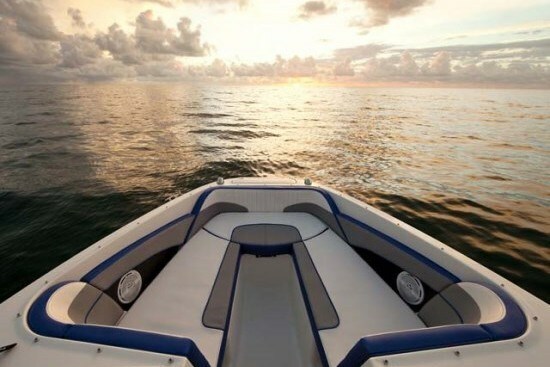 Outside design cues and interior appointments make the 21 Jet bowrider a Sea Ray through and through. The molded and integrated swim platform is two-level with the aft level just above the water for great watersports access and the upper level providing relaxing seating and conversational opportunities while the boat is stationary as well as providing easy access to the centre transom walk-thru to the cockpit. A three-step stainless steel folding boarding ladder is neatly stored beneath the centre of the swim platform. The cockpit is completely surrounded with seating with storage compartments beneath. A U-shaped lounge starts at the passenger helm and extends back to the transom, across the transom and forward up the starboard side right to the driver’s helm seat. This standard swivel plus fore and aft adjustable helm bucket may be optionally upgraded to include a flip-up, “thigh-rise” bolster. Opposite the helm bucket, the forward portion of the U-shaped lounge converts to a forward-facing bench seat while at the same time becoming a rear-facing lounge. In the floor is a waterski storage locker with vinyl matting and gas-assist fibreglass hinged lid. 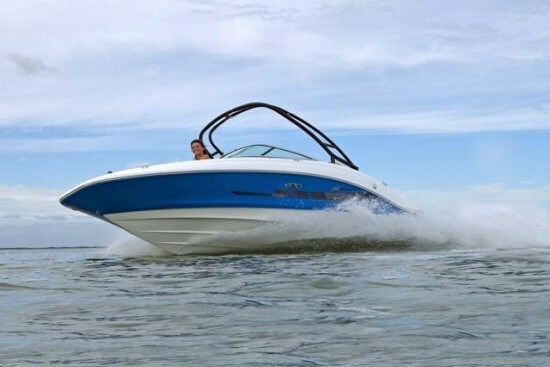 The passenger helm offers wakeboard storage and the driver’s helm offers additional storage. 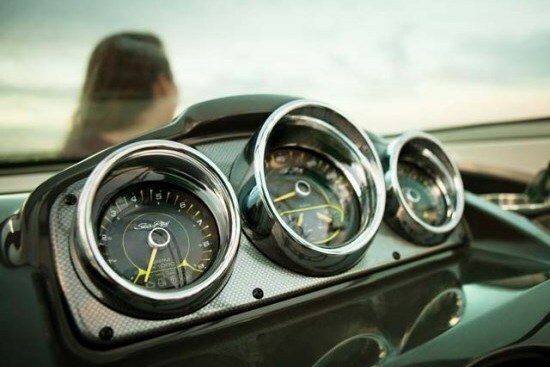 This driver’s helm and custom “soft-touch” dash with visor features a custom padded tilt steering wheel, custom Sea Ray instrumentation with all of your normal sterndrive-type engine information and equipped with low glare blue night lighting and stainless steel bezels on the gauges. 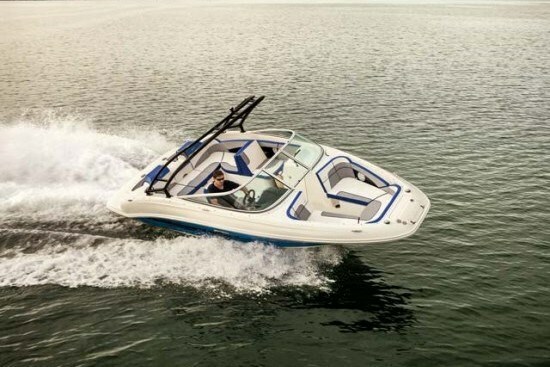 Moving forward and through the centre opening portion of a normal runabout-style curved tinted glass windshield is the bow seating area with a squared off front allowing more seating, elbow, and foot room. The large padded curved backrests on the forward-facing sections of the two helm consoles allow for full-out lounging and storage is provided below the seating sections. Right on the bow is an anchor storage locker with hinged lid. A bow access ladder suitable for beaching is optionally available. Other notable standard equipment includes a 25-quart cooler with dedicated storage, Sony® AM/FM/CD with MP3 port and four speakers, ski tow eye, and a tandem axle trailer with swing-away tongue and swivel tongue jack. 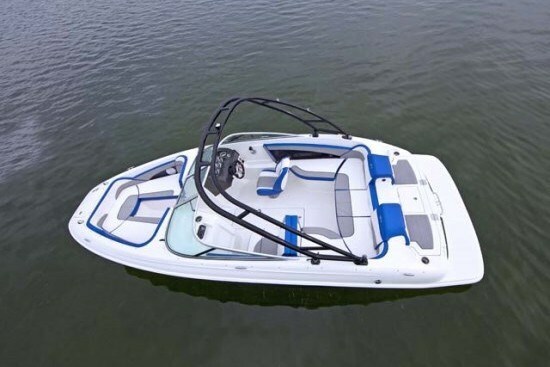 Notable options include a full canvas enclosure package or individually available canvas sections, snap-in cockpit carpet, bow and transom walk-thru filler cushions, upholstery upgrade package, two-tone hullside gelcoat colours, cockpit table, trailer upgrades, and a tubular aluminum, black, forward-facing, folding watersports tower complete with integrated bimini top.